Littoral translates as close to the shore of a sea or lake, a place that has deep meaning for many people. Many of us make memories on the beach or on the coast of a body of water. Those images and feelings can stay with us throughout our life, and in this film we see that for one woman, her only memories are those of the times she spent next Urmia Lake. 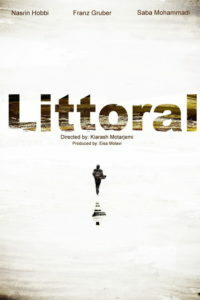 Littoral is an interesting and complex look into the human psyche and the effects of climate change as we watch the lake dry up as the film progresses. The protagonist watches as her treasured childhood memories dry up along with the lake and at points the film is truly heartbreaking. We see how important this place is to the protagonist and the effect it has on her when she realises she barely recognises it. Her only memories are those of her as a child around this lake, and now it faces complete desolation. The film is profound in it’s portrayal of climate change and what we are doing to our planet. Often it is easy to dismiss the changes that are happening, until they happen to something o somewhere that is personal and meaningful to us. Here the film clever links the topic of climate change to that of a womans’ declining mental health in an intriguing juxtaposition. The film has a definite style all of it’s own which helps its stand out and deliver it’s message rather than being just another documentary about climate change. It demonstrates the personal effects of the changing planet rather than the wider effects and that makes it all the more touching to watch. The colouring, editing and cinematography work together to create a film that is stylish and memorable, as well as affecting. The performances are heartfelt and the lead female takes us through all of her emotions on her face as we travel along her journey. A beautifully captivating film that both inspires and devastates.